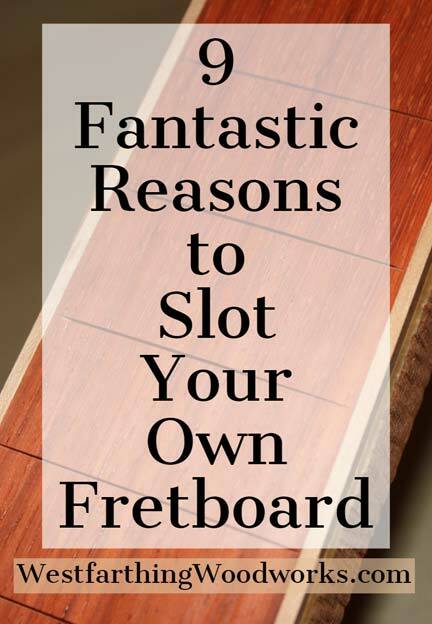 This is 9 great reasons why you should slot your own fretboards. Slotting a guitar fretboard is not as hard as you might think. In fact, there are a number of great reasons to do it yourself. Here are the reasons why, and how to make the project easy. Of all the measurements that you have to work with on your guitar build, the fret locations are some of the most critical. If the frets are not in the right places, the notes will not sound like they are supposed to. If you are making a full size neck, you need to cut up to 24 slots in the exact place they need to be, and that can be a little stressful. As a beginner, it’s sometimes too much to think about getting all the way to the last fret slot and making a mistake. Even though you do need to be careful when you make your fretboard, that should not stop you from making your own instead of buying them. Here are some great reasons why, and some tips on how to make the process really easy. The first thing about slotting your own fretboard is that you can make any scale you need. Every guitar you make can have a different fretboard. If you are buying them instead of slotting them yourself, you will need to buy a different board every time. Many guitar makers produce several different models in their shops. Each model can have a different scale, and slotting yourself allows you the freedom to do it. You can even experiment with scales, and try different scales on different instruments. If you have a scale length that is out of the ordinary, slotting the board yourself will give you the opportunity to use that scale. Longer basses are the most notable type of guitar in this category, because most shops don’t carry the really long scale lengths. Another thing about learning to slot fretboards yourself is that you can make your own fretboards for any fretted instrument. You are not limited to guitars at all, and this opens up a lot more to your shop if you want the challenge. There are lots of fretted instruments that can be slotted by hand or with a jig. I recommend the jig of course, but the point is that you are not limited. Mandolins, and Dulcimers are just a couple examples that you can make. 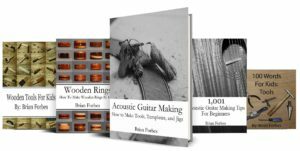 There are also unique guitars and stringed instruments that may not be very popular in your area, and you can make these too. Some of the more regional instruments like the Bouzouki are a good example, and you can make that fretboard yourself as well. The manufacturers of guitar making supplies are in the business of making money. Sure, they want to help you make a guitar, but they also want to turn a profit. When you are operating a business, you need to look at the bottom line. Products that sell are those that are in demand. The average guitar store sells a hundred Fender or Martin fretboards to every mandolin fretboard, and it’s even a higher ratio when you look at the more obscure boards. Slotting your own fretboard gives you the ability to create things that the sellers don’t carry due to the low velocity of the product. It doesn’t make sense for bigger places to carry very specialized items, but when you make them yourself, you can make anything you want. This is my favorite reason to slot your own fretboard. Making your own scale length is a way to give your guitars a personal touch, and set them apart from other guitars in the market. It’s an easy process, and there are tools available for free to do it. If you do a little research, you will notice that there is a difference in feeling between playing a longer scale and a shorter scale. When you decide that you want to make your own scale length, make sure to think about those factors. Don’t change the overall length by very much though, because you can go too far in a hurry, but play around with your own scale length. This, like any other things on your guitar, becomes a custom option, and a way to make your guitars all your own. Slotting the frets is easier than you might think too. 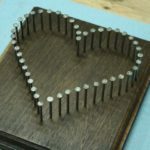 My Fretboard Slotting Jig is a simple jig that you can make yourself, and it lets you duplicate any existing fretboard. This means even if you have to slot the first one, you will never have to do it by hand again. Also, the jig can be completely free if you make it from scraps in the shop, so you have nothing to lose by giving it a try. I made my first fret slotting jig by hand a long time ago, and have been using it in the shop ever since. Essentially, the master fretboard becomes like a template, and you tape another unslotted fretboard to the top of it. As the bottom board locates on a bar, you saw a matching slot on the top board. Repeat this 24 times, and you have a perfect fretboard without measuring once. Super easy. Another great reason to make your own fretboards is that the tools are not expensive. Even as a brand new guitar maker, the tools that you need are few. A good fret saw is not terribly expensive, and you can get many years of service from it. Look online for a saw that is made for the fret wire that you are using. Some places sell a generic saw that is not made for the particular fret wire. It’s all about the kerf of the saw, which means how wide of a slot it will cut. For example, if you want the fret to fit well, the slot needs to bee big enough to take the wire, but not too big that the wire doesn’t hold well. If the slot is too narrow, the opposite problem can happen, and it will be hard to hammer it in. This is where a good saw that is meant to make the right slot is important. Even if this saw is a couple more dollars, don’t take the chance. Just buy the saw that you need, and you won’t have to worry about your frets in the future. 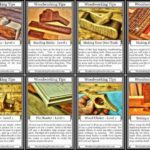 One of the best reasons to slot your boards yourself is about money. The tools and the machines that it takes to produce finished boards are not cheap. It also takes a person to run those machines, again not cheap. When you think about it, after a certain number of boards, the tools have been paid off, but the price of the boards will not go down. Forever and ever the customers are paying for the fact that they don’t have all the tools they need. In reality, the tools that the manufacturers are using are made for high end production. Their fret slotting tools are very expensive, and they have to be in order to be really fast. As a small shop, a fret slotting jig is all you need to do the work yourself. If you don’t have a way to thin your boards to 1/4 inch for fretboard thickness, then you can just buy pieces already thinned. They are common in higher end woodworking stores, and that can get you around not having a thickness planer for a while. There is also more wood choice when you make your own fretboards. In most stores, the common woods are all that you will find. This is East Indian Rosewood and Ebony. If you love those two, then you are fine, but they tend to get old quickly. Slotting your own boards gives you more freedom to choose. After all, a custom guitar should be a custom guitar. 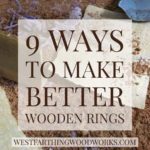 Settling for one wood or another is no way to make something that should be all your own. Once you get a feeling for the types of wood that are in the world, you will be amazed and astounded at what nature can do. It will only take a little looking, I promise. After that, you will always want to have a custom fretboard. Every once in a while, you go into a wood store and you find something amazing. It can be the look, the deal, or more factors, but when you see it you know it. That one piece of wood that you just can’t leave the store without. 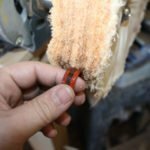 For woodworkers, this is a huge experience that is very common. 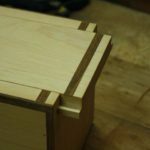 The event doesn’t happen that often, but it happens to many woodworkers, making it common between them. 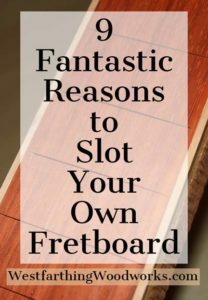 If you see a perfect fretboard piece, but you can’t slot your own boards, you will lose out. Instead of having to feel so excited then fall back to the floor depressed, just learn how to slot your own fretboards. It’s not very hard, and you can take those once in a lifetime boards and make some beautiful fretboards from them. Your Homework is to slot your next fretboard yourself. If that means you need to do a few things to prepare for that, then get started right away. The easiest and the most productive is to make your own fret slotting jig. 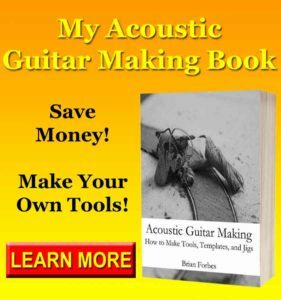 Make my jig following my directions, and you will have the biggest helper you could possibly have towards making your own fretboards and slotting them, yourself. Once you see how small the burden is, and remove it, you will feel an amazing sense of guitar making freedom. 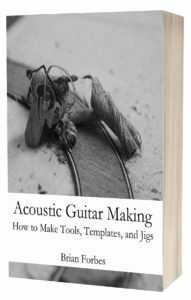 Now, instead of having to make a choice, you get to take any piece of wood you want and make a guitar fretboard. Before, you would have to choose between the few pieces of wood that the guitar making suppliers sold. Not any more. Once you give yourself the tools, you take control. This also applies to other areas of guitar making as well. Keep that in mind the next time something small slows you down, or the next time you are faced with a choice that has only a few alternatives.